Chronic ear problems are a new Scottish Terrier health issue for me. Before Nibbles and Pudley, I never had a dog with any kind of ear problems. 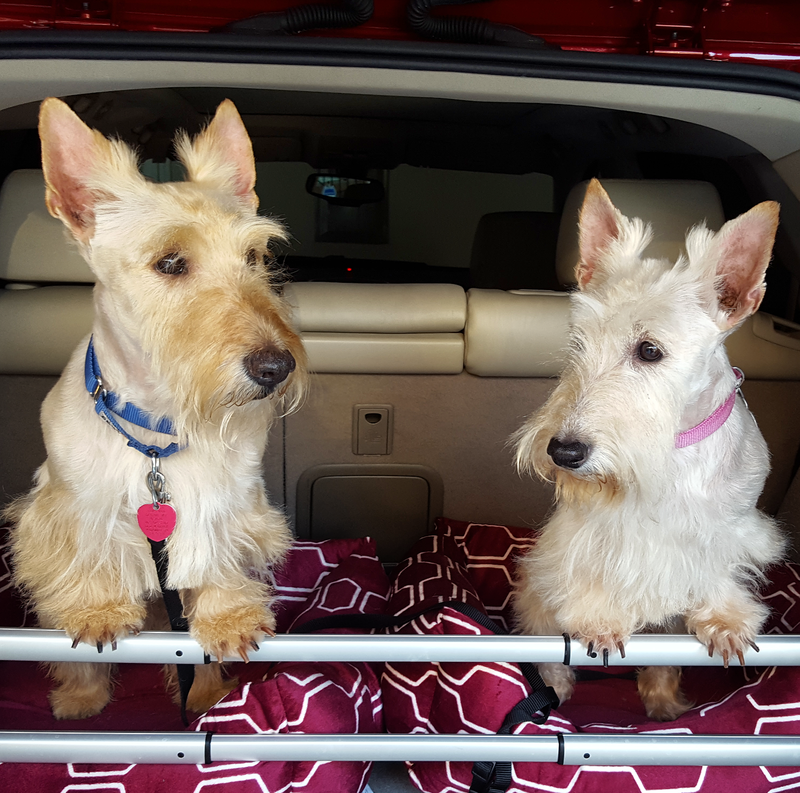 On their initial visit with the V-E-T, which was only days into their stay at the Scottie House, I learned that though they already had been undergoing treatment, their ears were in pretty bad shape. So, we had something called BNT treatment done in which this thick, yellowish goop is placed all over the inside of a dog's ears to help clean things up. It was evident Nibbles and Pudley did not appreciate having that goop inside their ears. Every few minutes, they would shake their heads from side to side trying to clear them out. And, when we returned to the Scottie House, they tried to rub their ears on any surface of the house they could find that would help relieve them of the yucky goop. We also switched their diets to the same limited ingredient formula Heather and Mr. K have used for years in case they, like Mr. K, had food allergies. For two weeks, things seemed pretty good and I thought we were in the clear. Not long thereafter, Nibble and Pudley started pawing at and itching their ears again. Then, there was the return of the head shaking. I knew another trip to the V-E-T was in store for us. Poor Nibbles and Pudley aren't accustomed to trips to the V-E-T as Heather and Mr. K are and so they nothing short of terrified when we go. Nibbles even shakes and refuses to cross through the door's threshold on her own. 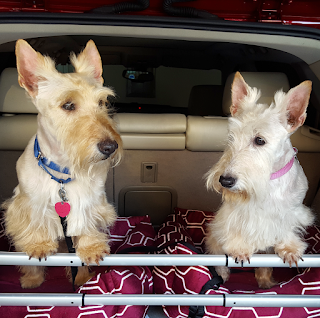 Despite this, I knew they needed relief from itchy ears so we hopped into the Scottie Mobile and off to the V-E-T we went for the fifth or sixth time in the last month. The V-E-T recommended doing another BNT treatment in the hopes it would clear out Nibbles' and Pudley's ears once and for all. If it doesn't, we'll be back at the V-E-T in another two weeks or so in search of another solution. Though the BNT treatment does a good job for the two weeks or so it lasts, it costs $82 for both dogs and I'm not sure if BNT treatment is even intended to be a long-term solution. If it can be, combining that cost with Heather's treatment for Cushing's every two weeks will necessitate our canine healthcare budget for the year being readjusted considerably! Tell us: have you ever had a pup with chronic ear issues and what treatment did you choose? One advantage to being a parrot is that you don't have ear problems. Three Scots and one Dachshund knock on wood never had ear problems. Though Sweet William shakes his head but the vet says it is from neck spasms which radiates from him having dysplasia of both from legs. I recently had to take my Scottie to the vet with itchy ears. My vet treated his ears with the same goop. After the first treatment, my vet recommended that I use Ketomax to clean his ears every week or so. This is a special rinse that I purchased from the vet that has ketoconazole in it, which is an anti fungal. The treatment combined with cleaning his ears with this solution seems to have eased his itchy ears. Hope this helps! Best of luck to you and your Scottie family!! I too have used this on my scottie Shiloh with great success! WOur Noots had some ongoing ear problems. Changing her food to grain- free, limited ingredient turkey and potato helped some. We also have used Zymox with good success. It is pretty easy to use, and once you do a course of it, I you can just do weekly maintenance. I bought the one with the sreroid in it, as it gave Noots some instant relief until the enzymes could work. I also made sure I doused her ears after every Bath or heavy rainstorm, I use apple cider vinegar and rubbing alcohol diluted with a little water. This can sting, so I only used it when her ears weren't actively bothering her. Hope you can get things under control! Generally we find for ernest, who has had problems with his ears in the past a grain free low sugar diet has work wonders. We are using zigniture food now as there are no white potatoes in it. Things like lots of sweet potatoes or white potatoes seem to create more yeast problems for us. I've had 12 Scotties over the years and only one of them had ear issues. She was the first Florida rescue and she all kinds of problems. I do use a preventative ear solution from the vet periodically. Our Dougal is prone to yeast issues. Beef is the big culprit for him. I use Grapefruit Seed Extract whenever he starts with ear scratching. It is an OTC natural remedy that is very safe for any 4-legged ones. And about $7.00 for a bottle. It is very soothing and does not bother him at all. I've had 5 Scotties and only my last one has chronic ear infections. Sometimes Maggie just starts running around and rubbing her ears against anything she can find. My vet has given me a bottle of otamax to keep on hand to use whenever this happens or when she starts shaking her head. It usually calms things down in about 15 minutes or so. As a result of these incidents, she eventually developed hematomas in her ears which needed to be surgically removed. As a result, I now have a drop-eared scottie instead of a prick-eared one. Both of her ears no longer stand up. My Lady Fiona is like that! What the doc gave me didn't work, so I useda solution of Apple Cider vinegar and tea tree oil.